I know multiple people who have chosen/want to have homes in both Charleston and Nashville, and I was wondering why those two cities made such a natural connection. I mean, there's a direct Southwest flight now, which is awesome, but when you see restaurants like Husk and Butcher & Bee open their second location in Nashville, of all places, it made me wonder. Was it all Sean Brock's idea? Or is it that Charleston brings the water, coast, and beautiful historic buildings, and Nashville brings the grittier country, musical element? Obviously, I've digressed. But when Dan and I were looking for a date night dinner, and Butcher & Bee popped up as an option, we snagged the reservation and hoofed it to East Nashville. We easily found on-street parking, but finding the building was a little harder. It's kind of non-descript, unless you're standing across the street to see the oversized name painted on the wall. For reference, it's next door to Fat Bottom's current location, ahead of their move to the Nations. Use your GPS and you'll find it! Inside, the decor and concept is on-trend. Definitely hipster vibes, use of metal and wood, open kitchen... it's not unique for Nashville, but it's still pleasing and inviting. It's kind of dark too, which transports you from the hot summer daylight. The Butcher & Bee menu is chock full of Mezze dishes, and the menu is tailored to be local. We decided to do all shared plates, which we've enjoyed doing lately. The funny part is, we were able to agree on 100% of our choices within minutes! I told him this is why we're married. I ordered a delicious cocktail (the Rosé O'Donnell, with rosé wine, aperol, strawberry rhubarb jam, and grapefuit... it's like they made it just for me) and we kicked off with some plates. 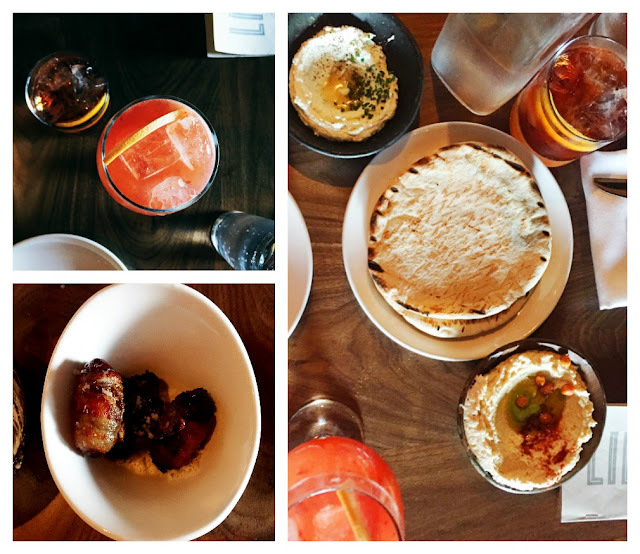 First up, we had the whipped feta, hummus, and bacon-wrapped dates. The whipped feta, served with fermented honey and black pepper, was so good that I want to try to make a version at home. The waitress hinted that cream cheese was involved. Holy cow. We scooped it up with warm pita bread until it was gone. The other dishes were also delish, but we couldn't stop raving about the whipped feta. Next up, we had house fries. Dan didn't love their homemade ketchup (he's a Heinz man, via Pittsburgh), but the fries were the perfect crispy potatoes. They also tasted good in the hummus. Following the fries, we had the brisket meatballs, served with lime yogurt, pickled red onion, and Dream Weaver sauce. I have no idea what Dream Weaver sauce is, but it was HOT. LOL. The meatballs were good and moist, pretty good. I probably wouldn't order them again because there were other things on the menu that I enjoyed more. By the time we got to the chorizo gnocchi, we were starting to slow down. The sauce is a spicy tomato sugo, and the gnocchi are definitely ricotta vs. potato in density and texture. At least, that's what we tasted! It was delicious, and very dense. I can't imagine someone eating this by themselves, as sharing it we barely tackled it. So at this point, we were full. Stuffed. Done. And then the server asked if we want dessert, and she started listing the options. We were like, well, that banana pie sounds wonderful. Vanilla wafer crust. Banana pudding-style filling. Homemade marshmallow layered on top. Toasted. Served on top of a pool of chocolate. Holy sh*t. It was so rich and good. It was the kind of thing that you just keep shoveling into your mouth, while moaning how full you are and how you couldn't possibly finish it. Or at least, that's what we did. I took two photos, as evidence of its awesome-ness. 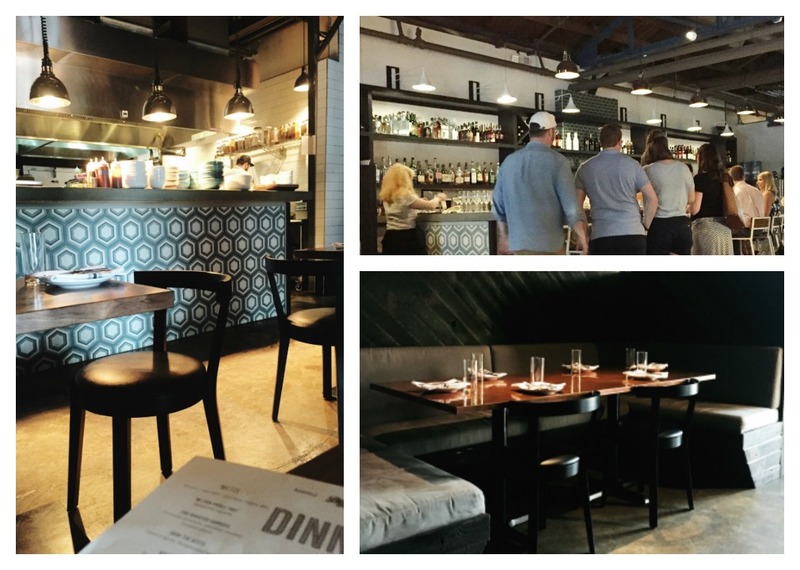 Overall, we really enjoyed our meal at Butcher & Bee. I'd definitely come back for drinks and dessert, and some small plates too. It's definitely the kind of place to eat socially, sharing, and indulging in some local flavors. Not everything was something I'd have again, but some of the things we tried I still find myself drooling over now. It's a great choice if you're in East Nashville.